Donnie was on Kiss 108 this morning. Watch the Kiss 108 website for the podcast. He will also be on Fox and Friends this morning. 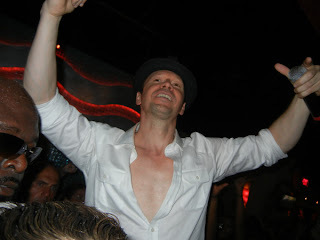 NKOTBSB tour April May 2012 UK and Europe ( including Ireland ) on sale 28th October, VIP presale before that. Here we go !!! NKOTBSB, NO Spain and NO Portugal. Sorry, there was just no space to fit it all in and do Australia as well. Jordan did an interview with Virgin 95.3 this morning... He says NKOTBSB will be in Europe, Asia and back to the US/Canada next year! It's the news that many boy band fans have been waiting for, New Kids on the Block and The Backstreet Boys are set to announce their anticipated UK tour dates early next week. Be sure to check back to Stereoboard from Monday 3rd October, as we'll be posting the dates as soon as they are announced! New Kids on the Block have recently toured the US with The Backstreet Boys and Stereoboard revealed earlier this year that NKOTB’s manager Jared Paul was busy arranging UK and European dates. Paul is now on the verge of revealing the dates to fans. Earlier this year in July, a series of tweets between Jared Paul and fans revealed that the dates were being arranged. In one tweet, Paul wrote, "Inquiring bheads- yes I'm in meetings for the upcming uk+euro tour. Its bn a long time cmng. as soon as I knw the final details so will u XO". The enticing combination of pop supergroups NKOTB and The Backstreet Boys (abbreviated to NKOTB/BSB) will send fans into a frenzy once dates have been announced, with tickets for what will be arena shows expected to be in huge demand. Check back to Stereoboard.com from Monday 3rd October as its expected that the NKOTBSB tour dates will be announced early next week with tickets for the shows possibly onsale from 9am on Friday 7th October. Jonathan Knight is currently on vacation in Italy and hanging out with Kirstie Alley. Jonathan posted some photos here and Kirstie posted some photos here! 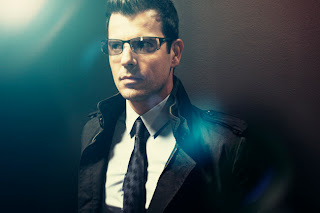 Jordan Knight helps write new single for Michael Africk - Listen here! In an article by the Edmonton Journal last May, it was reported that Jordan's "Unfinished" album would include a song called "Make it Loud". As we know, the song did not make the album, but it appears the song has surfaced, except it's not Jordan's version. Michael Africk's new single is called "Make It Loud" and Michael posted on his Facebook page that "Make it Loud" was written by Michael Africk, Louis Lü Balz Bell, Mike Caputo and Jordan Knight. So, I'm guessing it is the same song Jordan recorded. At any rate, Jordan did help write this song. Check it out below! The single is also available on Amazon.com! A somewhat frequently asked question is how to find out where Donnie is taping Blue Bloods. 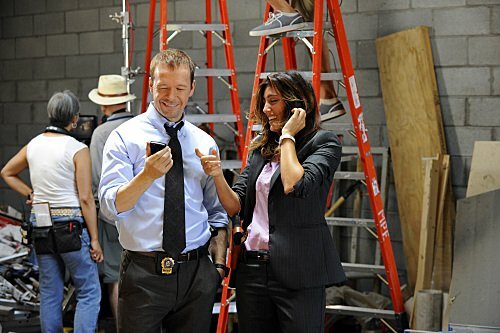 You can sometimes find places Blue Bloods is filming at On Location Vacations (@olv on Twitter) or Before the Trailer (@b4thetrailer on Twitter). 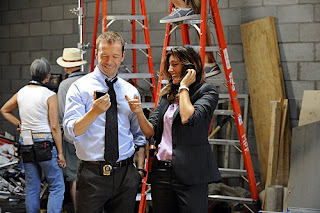 And speaking of Blue Bloods, here are some recent photos of Donnie and Bridget Moynahan from Bauer-Griffin. Behind the scenes video clips of Jordan on "Cover Me Canada"
Here is the audio of Jordan Knight on Mix 97. He talks about how he got the opportunity to be on "Cover Me Canada" and more. They are releasing tickets for ddub's "VIP AREA" for McFaddens's 10 yr. 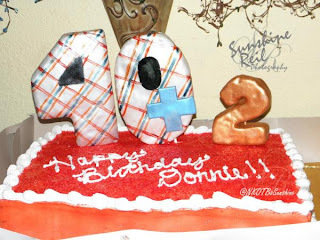 Anniversary Celebration hosted by Donnie Wahlberg at 3pm today. Jordan will be on 98.1 CHFI (Toronto) at 7:30 this morning. You can listen online here! Don't forget he'll also be on Breakfast TV this morning as well! 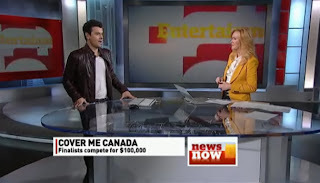 How to get tickets to see Jordan Knight on "Cover Me Canada"
You can get tickets to "Cover Me Canada" by going to ticketweb.ca. Tickets for the following week will be released every Sunday at 10pm. Audience members must be at least 16-years-old; photo ID is required. Dress code: Please wear bright, solid-coloured tops. No hats, sunglasses, costumes or shirts with logos, please. Jordan will be on Mix97 (Belleville, Ontario) tomorrow morning. You can listen here. 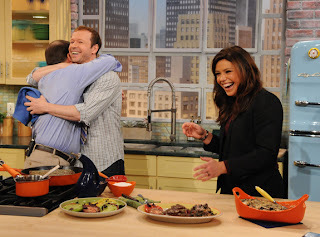 Here is Donnie's complete appearance on the Rachael Ray Show today. You can buy tickets online from McFaddens here and Worldofjohnny will announce another option for tickets later today. And, about those hamburgers, Wahlberg told us that not only is he deadly, deliciously serious about opening a patty joint with his brothers called Wahlburgers, but they're also planning to shoot an Internet-based reality show about the effort. "Listen, when I told the story that I wanted to do a show about a movie star and his five friends running around Hollywood, everybody said it was the dumbest idea in the world," Wahlberg said of his "Entourage" success. "My brother is a five-star chef. So it's a family-run business. You're going to see us doing a reality show about building the business. This is the real deal. We'll throw it up there and see if it sticks." Don't forget Donnie will be on Rachael Ray's show tomorrow. 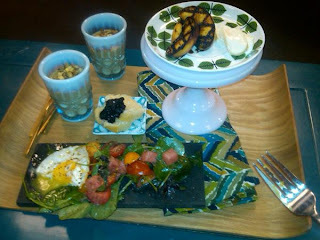 There is a preview clip on The Rachael Ray Show Website. Danny Wood is auctioning off an autographed Celtics Jersey for Susan G. Komen Foundation. 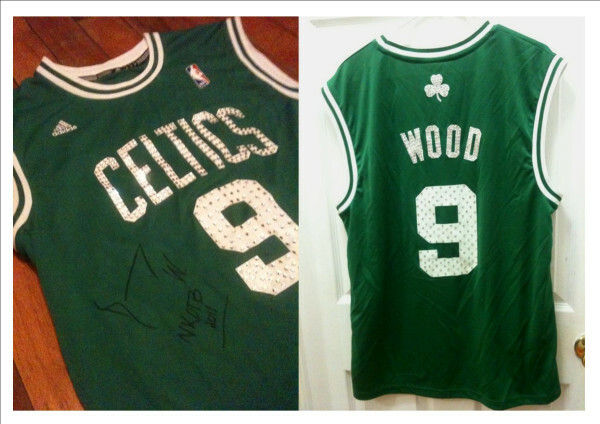 Click here to bid! 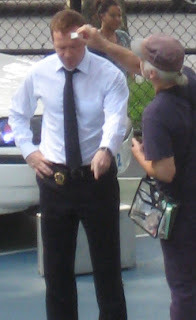 On Location Vacations posted some recent photos of the filming of Blue Bloods. Photographer Gary Land took some photos of Jordan recently. You can view them here. Jordan adjusting his cup during the commercial break. Judges dancing during commercial break. Judges arriving before the show. If you live in Canada, you can watch the full episode of the series premiere of "Cover Me Canada" here. If you are outside of Canada, yikes77 has the whole episode available for download here. 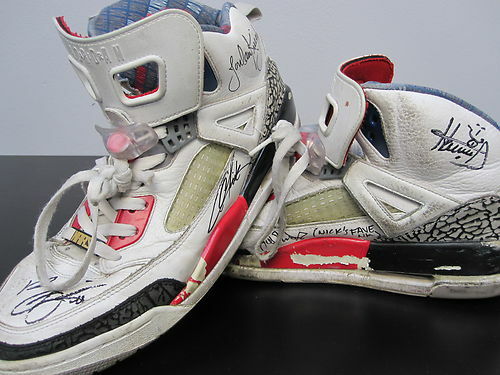 And if you just want to see Jordan's parts, go here. Joey McIntyre attended the Pink Party last week and he is interviewed briefly at the end of this video (5:13 mark). He talks about Betty Wood and New Kids on the Block fans raising money to fight breast cancer in her memory. By the day it gets more and more exciting. This is a really big production, there's going to be amazing talent on the stage and I think it's going to be a real big hit, I really do. On the contestants: We're sequestered! We have armed guards right now actually. And if I even look the wrong way I may get electrocuted... no, we haven't seen any of the talent yet. I've heard that they've really picked some of the brightest and best unknown artists in Canada. You know they went out and really picked the cream of the crop and got some great talent. On each other (the judges): This is a reunion! From 10 years ago... my manager used to manage Deborah and I used to see her all the time. I worked with Ron at Interscope. He was helping me develop some songs at that label for a solo project so it's really funny that we have reunited like this. On the eventual winner: My hope is that they take full advantage of the exposure that they're going to get on the show. From the feedback that they get from us and from the feedback that they get from fans. They have a really great chance to develop their own fanbase, whether they win or not and the show is encouraging them and actually making them get involved in the social media aspect of everything. They really all have a great chance of developing their own fanbase. On Canadian music he wants to hear: Alanis Morrisette's Jagged Little Pill album comes to mind. I would like to see someone do something with that. Again, I don't know the material they're doing, I don't even know the artists. When this show goes live that's when I know what the heck's going on. I'm just looking forward to seeing the actual artists do their thing. On why YOU should watch: I think it's a nice twist on a kind of well known concept of musical groups competing in a reality show because they're singing songs that everybody knows and they're making it their own. Another great thing is that it's not going to be all groups from the same genre. There's country, there's hip hop, there's rock. They're all from a different genre so it's not going to be mundane and boring. It's going to be very exciting. 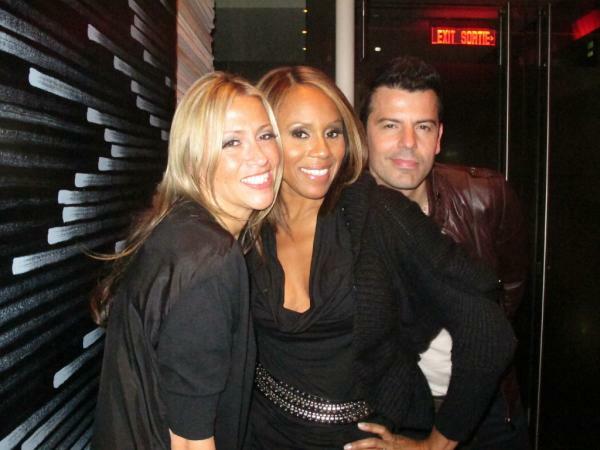 Here is a photo Jordan shared via Twitter with his Cover Me co-stars, Nicole Appleton and Deborah Cox. Also, word from Twitter is Jordan will be joining Nicole Appleton, Deborah Cox, & Ron Fair at the Hazelton Hotel in Toronto for CBC press tomorrow from 1 to 2PM. 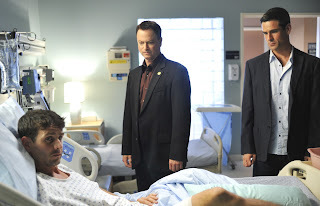 CBS posted a video taking a look back on season 1 of Blue Bloods. Yesterday Donnie shared a quick video on the set of Blue Bloods where he comes up with a new term for the first shot of the day while on set. Jordan has a new contest on his website in which you can win a package including a t-shirt, an autographed "Unfinshed" CD, poster and pendant. Go here to enter. 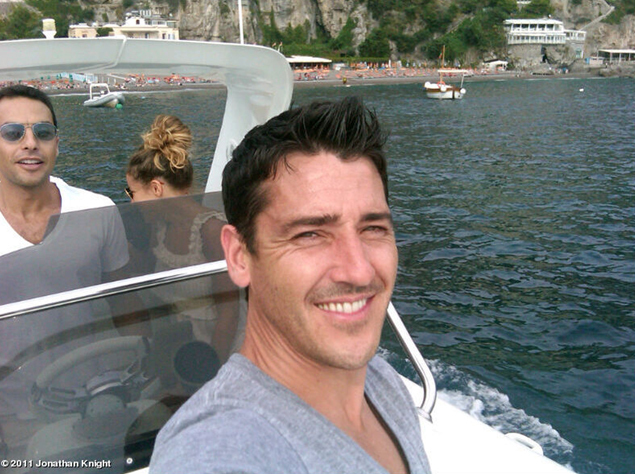 Joey talks about the smiley face shirt from the Hangin' Tough days on the NKOTB & Us website. Here is an interview Jordan did with CBC News. He talks about his upcoming appearance on "Cover Me Canada" and more. Here is a quick video clip of Jordan from SWRVtv. He is asked how chemistry between the New Kids On The Block changed over the years. There is another video here, but I can't embed it or even get a direct link to it, so just do a search for "Jordan Knight". He talks about a fan asking him to sign her toenail. 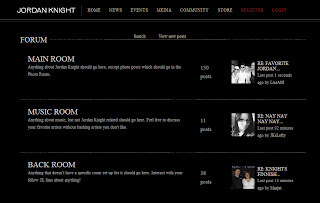 The community section of jordanknight.com is now up and running! 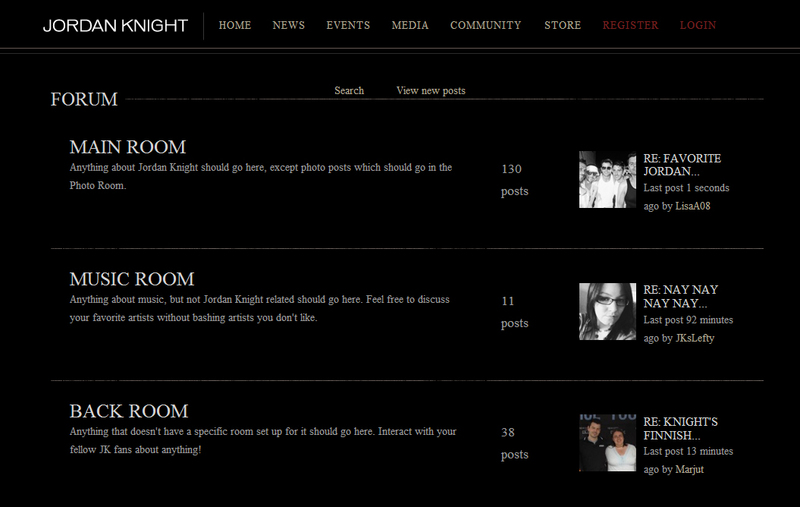 It includes a forum, chat room, blogs and more. Jonathan and Kirstie were also in the audience for Richie Rich's POPLUXE fashion show at Lavo Nightclub yesterday. You can see photos here (most of the Jonathan photos are towards the bottom). This site also has some photos of Jonathan and Kirstie out and about. Apparently the author is not a New Kids fan since they refer to Jonathan as a "mystery man". Nick Carter is auctioning off a pair of tennis shoes signed by all the members of the New Kids On The Block and Backstreet Boys. The money raised goes to globalgreen.com which "fosters a global value shift toward a sustainable and secure future by reconnecting humanity with the environment". Click here to view the auction. 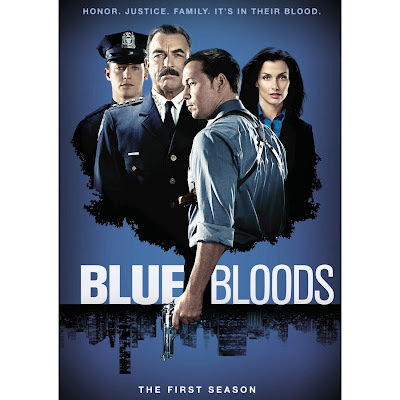 "Blue Bloods: The First Season" will be available on DVD tomorrow. 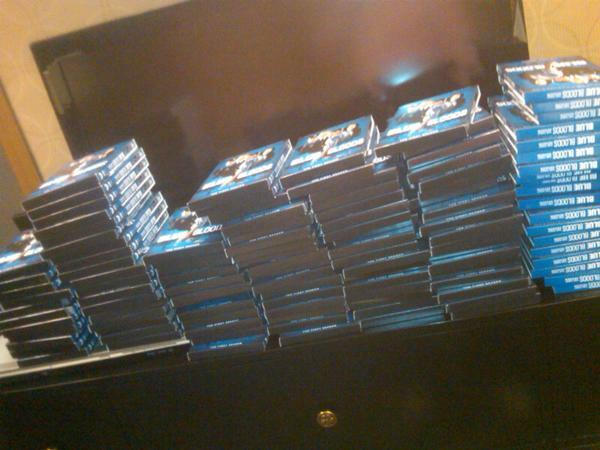 It includes all 22 episodes as well as deleted scenes, featurettes, promos, bloopers. 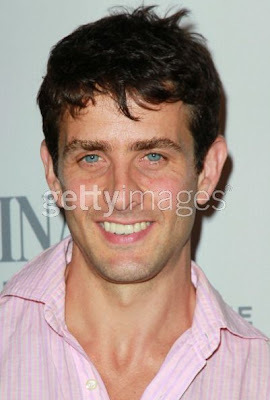 Joey attended the Pink Party to benefit Cedars-Sinai Women’s Cancer Program on Saturday (September 10) in Hollywood. 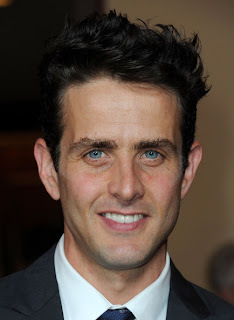 In this video clip Joey McIntyre talks about where he was on 9/11/01. He mentioned he lived near the World Trade Center at the time, but he was in Seattle on that day. He then drove across the country to get back home to NY. 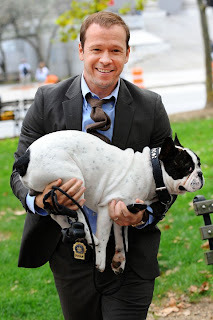 Here is another video of Donnie on the set of Blue Bloods! They always have the best food here... Though I'm cooking with Rachael today! Here is a preview clip for the season premiere of Blue Bloods. It airs on September 23. Tony Bennett and Carrie Underwood make guest appearances. 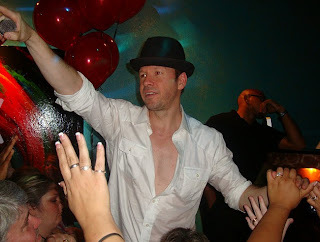 New Kids on the Block fan and author Nikki Van Noy is putting together a book about the New Kids called "NKOTB and Us". The book will be published by Simon & Schuster and released in 2012. She already has posted a few memories from fans as well as memories from Danny and Jordan on the book's website (click here to view). She will also be interviewing Jonathan this week, so if you have a question you would like to submit, fill out this form. If you have a story and/or photos you would like to share and possibly have published in the book, go here (deadline is September 15). And a bunch more videos are posted at khrutherford's channel. Does anyone have any more video or photos from the party? Leave a comment below with the link! Hi Jordan, thanks for speaking to us - how's it going? Not too bad, actually, it's kinda funny - my power just went out. Kinda weird, all the power in my house just died. That's a bit odd. Where are you at the moment? I'm in Massachusetts. We had the storm, the hurricane. Yeah, so Irene. It's probably something related to that. I'm not too worried about it. To the business at hand sir, you've been announced as one of the judges for Cover Me Canada, how much do you know about the contestants? We're still going to learn more about the contestants, but from what I hear, the producers of the show have scoured the country really, and have come up with the cream of the crop. It's not really like American Idol where they let people come on and some of them make fools of themselves. It's really acts that are bubbling under and on the cusp of becoming known stars and known recording artists. It'll be really cool I think, seeing the talent Canada has. Do you have any predictions for how the acts will get on? Well there are different kinds of acts, there's country, there's hip hop, there's R&B - different flavours. I think that'll make it a lot of fun. What do you know about the other judges? I go back - I know Ron Fair and I know Deborah Cox. I used to be managed by the same manager as Deborah and I worked with Ron at Interscope Records about 10 years ago, so that's pretty cool. Yeah, he's a great producer. He's kind of a big wig in the executive field of the record business! What are you looking for from the contestants? Me, I'm looking for creativity, originality, star quality and musicianship. The whole package, really. Sometimes you don't know what you're looking for, some people are just so original they stand out. Just that kind of star quality appeal. That can come in many ways, you could have a very introverted artist and because their artistry is so incredible they really stand out. It's hard to say what's going to make a person a star really. You've experienced so much in the music world already, so for someone to stand out for you they'll have to be pretty special, right? Well, I have seen many different acts. My whole thing is that I can maybe see more of the potential in the contestants and try to help coach them along because I personally know the process. I know what it takes to get from A to Z, as far as being groomed and grooming myself and the process of creating a song or creating a stage presence. Also, I know what might be going through their minds on stage, or while they're creating music. Their hopes, their fears, their process. Maybe I can give a good perspective on that as well. How do the acts make the cover songs their own? I think they just have to let their abilities translate the songs into what they do best. If they're great harmonizers they've got to take the melody of the song and make it theirs. There might be a hip-hop group that are assigned a country song - they've just got to focus on what they know, their genre, their strengths and flip the song into what they do best. How does covering classics compare to performing original songs? It think it's more of a challenge, but I think it'll be fun for the audience because we will know the song, and how it's supposed to sound. I think for the audience it'll be fun to watch them recreate the song and it'll give the audience a springboard, a platform into what the artist does with it because it's a known song. It'll be more of a challenge, maybe, for the artist to flip the song and make it their own. Speaking of the audience, what are you asking of the people at home? How can they help? A lot of responsibility is going to go onto the artist, they're going to be encouraged to get involved with social media and to create their Twitter accounts and Facebook pages and a lot of their points are going to go in to how many followers they have on Twitter and how many likes they have on Facebook, all that kind of stuff. So we want the audience to get involved in the social media aspect, and I think they will. A lot of that is going to be on the show, the artists pushing themselves out there and getting the audience involved and to really back them. It's going to be interesting to see the artist develop a fanbase through the show. And I think that's a great thing, even if they don't win, even if they don't make it to the final rounds they will be so much better off. It's going to be great for all the artists on the show to have that opportunity to create a broader fanbase on a national level. Do you have any favourite Canadian songs or artists to cover? You know what? I haven't done much homework on that aspect! So, y'know, there's the stock answer: Bryan Adams, who's incredible. I hope that some of his songs are on the show. I'm sure they will be. Oh! Alanis Morissette! I really hope that some of her songs will be translated. Jagged Little Pill was great, so I hope something from that will be on the show. You can follow Jordan on Twitter @jordanknight, and be sure to follow us here at @CBCLive and @CBCCoverMe. 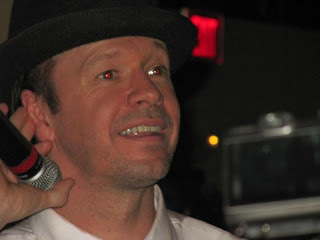 Positive Side of Life, Sports and Entertainment interviewed Donnie Wahlberg. Donnie reflects on how his career started and how he handled fame and money. 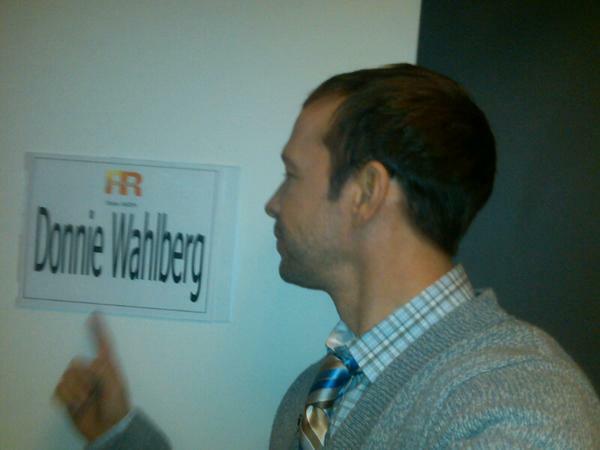 He also talks about Marky Mark, giving his fans personal attention, and Amnesty International in Santiago, Chile. We've seen Mark Wahlberg sing, dance, act and even model in his skivvies. So could reality TV be next for the A-lister formerly known as Marky Mark? Wahlberg revealed earlier today that he and his brothers are thinking about shooting a reality series that would follow the opening of their new high-end burger joint, Wahlburger's. However, Mark isn't so keen to appear on the show. "Maybe I'll be the Charlie's Angels of reality TV," Wahlberg said at the Graduate to Go Studio launch at the L.A. Harbor Boys & Girls Club. "You'll hear my voice. But obviously it's something that we'd want to control in every aspect and produce and make sure that we were doing something really quality." And the restaurant business isn't the only venture on Wahlberg's mind. "We are interested at some point or another doing our own clothing line in the future," he said. "As well as a health and wellness business that will help people first and foremost feel good, exercise, eat right and then look good...Eighty-five percent of the population doesn't exercise and eat right, and you want to be able to push them in the direction of extending their lifespan and living healthy lives." Speaking of living well, Wahlberg hopes partnering with the Taco Bell Foundation for Teens for today's launch of the Graduate to Go Studio will have a major impact on disadvantaged youth. "They just keep creating new ways for kids to want to stay in school and want to stay out of trouble," he said. "I just love what they do."